Posted by: Tom Daly in: culture No Comments on Progress! It’s time for America to once again “pivot” and seek a new direction on how we operate as a people. There’s one thing you have to say for the U.S., we’re never satisfied and always looking to improve things, willing to embrace sometimes uncomfortable change in the name of progress. Which leads me to reflect on how well we, as a people, progressed over the past years. And I don’t mean the last eight years of one president’s tenure, but rather as a people over the last decades, or even century. A great new book on the subject is simply titled “Progress” by the Swedish author Johan Norberg. A member of the Cato Institute, which initially gave me pause given its reported political slant of a specific agenda, nevertheless puts forward a compelling argument that we, as a people, are a lot better off than ever. Taking his data from fairly objective sources such as the United Nations, the World Bank, and the World Health Organization his meta-analysis of such macro-level data leaves me feeling pretty good, which isn’t easy to find in today’s press. A good start in the read is the notation by the author that by the time I finished reading the first chapter one evening that 2,000 people would have escaped from poverty. Reading further, and taking a longer horizon, I find that at the start of the 20th century the average life expectancy was 31 years of age, in one-hundred years that has increased to 71 years; todays’ life expectancy in the U.S. is nearly 79. Pretty good progress, I’d say. The book is evenly divided into ten sections that each distinctly describe how we as a people have progressed. Topics include: food, sanitation, poverty, violence, freedom, equality, literacy, the environment, child welfare, and life expectancy. Some of the facts are startling, enough to sober even the loudest doomsayers and “Chicken Littles” amongst the flock. Norberg notes that humankind has made more progress in the last 100 years than we have in the prior 100,000. A prime example is that over a quarter of a million people have gained access to clean water every day for the last 25 years. Or the fact that in 1900 only 21% of the world was literate, whereas 86% are as of 2015. Electricity? Antibiotics? The Internet? So while we spend an inordinate amount of time nowadays focusing on the plight of Millennials, the volatility of the stock market, or the inevitable transition to the twentieth new president since the beginning of the last century, Norberg aptly puts into perspective that a lot good has happened to humankind lately, and I dare to say especially Americans. So while I too might wonder what’s in store for the future, all I need do is look back at the recent past, pause and reflect, and understand all is very, very good. Really. Posted by: Martin Molloy in: culture No Comments on Art at the U-Haul? It’s nice to see more and more art and architecture being preserved by businesses as they renovate their spaces. Here in Durham, North Carolina the re-imagining of manufacturing sites, office buildings, store fronts, etc. have resulted in a collection of old-meets-new style spaces, including the American Tobacco campus, Golden Belt, The Durham Hotel, and the 21C Hotel downtown. In St. Louis, a lobby ceiling sculpture by Isamu Noguchi was recently rediscovered in a U-Haul office when drop ceilings were removed. As a result, the regional office owner decided to restore the ceiling and display it for all to see. It’s refreshing to see that progress doesn’t always mean throwing out the existing or traditional, especially in our public and business spaces which can often feel cold or impersonal as new spaces are designed and built. The New York Times highlighted this recently in an article regarding airport spaces that seem to forget the people actually using them. Move Society Forward – Create Culturematics! Posted by: Tom Daly in: Uncategorized No Comments on Move Society Forward – Create Culturematics! In today’s fast and furious world, culturematics give one the opportunity to either take the reins and lead the charge in the creation of their own culturematic or at least participate in the process and contribute to one’s development. In the end, while you may not create the next Google or Starbucks, Grant allows us to participate in the mysterious process of innovation. If nothing else, it will stir one’s curiosity and allow you to dip into a creative pool of interesting people. Fun and relevant. This is the week where Apple makes its big product and software announcements. As usual, I’m sure there will be a mix of surprises, disappointments, and big changes that will generate a buzz on the internet. One interesting thing I saw leaked this morning was that Apple will stop giving away printers with new computer purchases. Instead, it is rumored they will give away content in the form of iTunes gift cards. I realize that this seems like a very subtle change on the surface, but it may be remembered as one of the first things that signaled the death of home printing. Many things have gone either ticketless (airlines) or paperless/scanable (events). Our mobile devices keep our correspondence, directions, coupons, etc. when we’re away from home so we don’t need to print those things out anymore. Documents are largely shared via e-mail or other cloud sources. Reading/notes are quickly moving to screens. 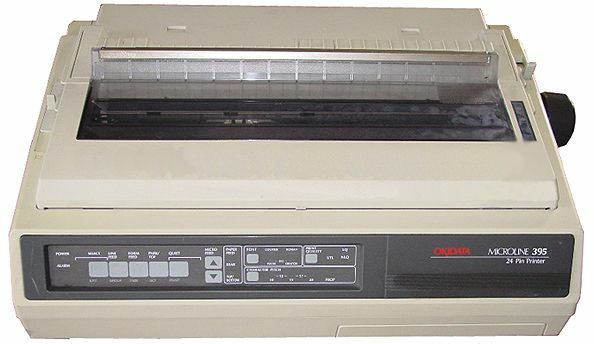 Beyond the scanning capabilities, is the home printer moving from necessity to relic?